My husband and I are committed dog people. Even when we had a rodent mooching around the house we refused to contemplate getting a cat. It was bound to be a hissy, scratchy thing that would terrorise our adored spaniel. The spaniel died 9 months ago and broke our hearts. Everyone has been urging us to get another, but it doesn’t feel that easy. I’m quite picky. It would need to be another rescue and definitely another cocker spaniel. We had become quite lazy as our girl got older and less able to do long walks. A new younger dog would require a change of attitude from us. Plus, there’s the feeling of guilt: how can you just replace a much loved pet as if it were a pair of jeans? And then there’s the issue of paying a fortune for doggy daycare while we’re both at work. Nevertheless, I had finally got to the point of starting the hunt for a new dog, trawling the various rehoming organisations’ websites and putting the word out to my dog-owning friends. 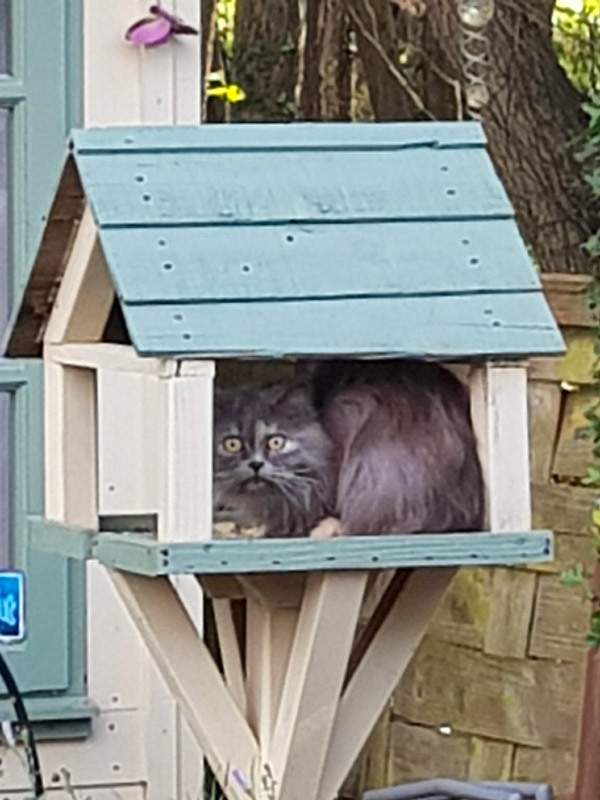 Then a few days ago I found a cat sitting in our bird table. Right in the middle of it, eating the stale crackers I had put out for the birds. I expected her to run away as I approached but she didn’t, choosing instead to follow me into the house. She was starving, so I gave her some cooked chicken. A rummage in her coat unearthed a couple of ticks and terrible earmites. I looked on social media to see if anyone had reported her missing. They hadn’t and nobody responded to the posts I put up about her. We took her to the vet to check for a microchip. She is chipped but, oddly, it wasn’t registered anywhere. We gave the vet our details, borrowed a carrier and brought her home until the owner could be found. We now don’t really want her owner to be found. For a cat, she makes a damn fine dog. She is utterly affectionate and polite. She spends hours sleeping but, when awake, is great company. She doesn’t hiss or scratch. We can go out for hours without worrying about her. She greets us when we come back. I now realise that what I really needed was a four-legged companion. It didn’t have to be a dog. And not all cats fit my preconceived ideas of the sort of pet a cat would be. A cat walked into my home and my life and doesn’t seem to want to leave. I’m very happy for her not to do so. Even though she keeps walking onto my keyboard as I write, with some amusing spelling consequences. What the cat/dog conundrum has made me recognise is how easy it is to carry on in the same way of thinking and, in doing so, risk missing out on an opportunity. We stick to what we know well and what feels comfortable. Sometimes something just happens to force a change. Sometimes it needs to come from within us. And sometimes we know we need to change something but just don’t know where to start. Coaching can help with that and give us the ability to focus on the outcomes we want and explore how to get there. PS. My husband says that if the cat isn’t claimed I need to decide whether to keep her, or go ahead with the plan to get a dog. Apparently I can’t have both. I’ve examined the options on this and decided to have both. Eventually. But that’s just between us, dear reader.